KOMFY Pet Products™ are made by kritter lovers, for kritter lovers. All KOMFY products are made in the USA. KOMFY Kritter™ revolutionizes the traditional hard plastic and soft e-collars. Traditional hard plastic collars provide no comfort for your pet during its healing process. The plastic strip that keeps the collar together can even bust wide open and fall off completely. Soft e-collars invite your pet to easily crush the collar so it can scratch wounds, rip out stitches, bite itself raw, and constantly lick the affected areas, all of which require another trip to the vet. 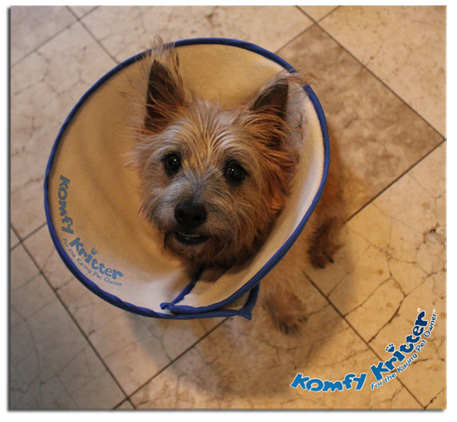 The KOMFY Kritter™ won't bend or crush, providing continued protection against licking, biting and scratching. KOMFY Kritter™ also maintains its round shape so your kritter’s head and face rests easily against the plush fabric like a pillow, offering more sleep time and less recovery time. KOMFY Kritter™ also has binding on the inner and outer edges to protect your kritter’s neck and your shins, not to mention your walls and furniture. When it gets dirty, simply remove the solid plastic insert and toss the KOMFY Kritter™ in the washing machine. KOMFY Kritter™ is made in the USA. Those traditional hard and soft e-collars are made in China, and have a strong chemical odor which is difficult if not impossible to eliminate. With KOMFY Katnip™ toys your pet can Play and Play Again™ because the toys are endlessly refillable with revolutionary pellet-shaped catnip. Even the cloth toys that can be refilled have those tiny non-stretch openings that are nearly impossible to get flaky catnip into without making a mess. Unlike the catnip toys at the big box store, KOMFY Katnip™ toys aren’t made from cloth material – they’re constructed from non-toxic plastic that won’t tear into itty-bitty pieces all over the carpet. Instead of sitting like a lump, KOMFY Katnip™ toys are tube-shaped, made to roll on carpet, wood flooring, and tile. Material toys can get dirty and difficult to clean – simply toss a KOMFY Katnip™ toy in the dishwasher and you’re good to Play and Play Again™ in no time. Ari the Cat, the KOMFY Pet Products™ mascot and spokeskitten, has used and enjoyed all our toys, so when you see the "Ari Tested and Approved" stamp, you know it's safe, fun, and effective for cats and kittens of all sizes and ages. KOMFY Katnip™ toys are environmentally conscious, non-toxic pet toys, all of which are washable and recyclable. Lightweight and simple to handle, KOMFY Katnip™ toys are also a little easier on a kitten’s tiny paws – there’s even a “Teenie” size smaller toy designed for young cats to effortlessly bat around. If that’s not enough, grab a “Biggie” model for full grown cats.